I'm trying to catch up on back burner projects in 2009. MrPeachez can tell you that I've got plenty of those. My challenge is going to be to not bring home any additional ones until I get caught up! 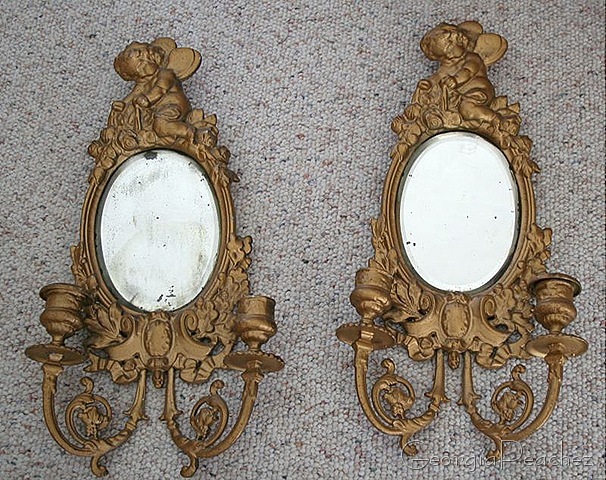 This pair of sconces were picked up at a church sale. I bought them thinking I would take out the mirrors and use them. They are beveled glass and they have that great old patina that mirrors get over time. In the end I just couldn't discard the sweet frames so I decided to give them an update with some hot pink paint. These are quite heavy, they are cast metal. The candle holders are attached with a single screw so they can be removed and then you would just have mirror sconces. They are going in my ETSY shop in case someone is looking for hot pink cherubs. 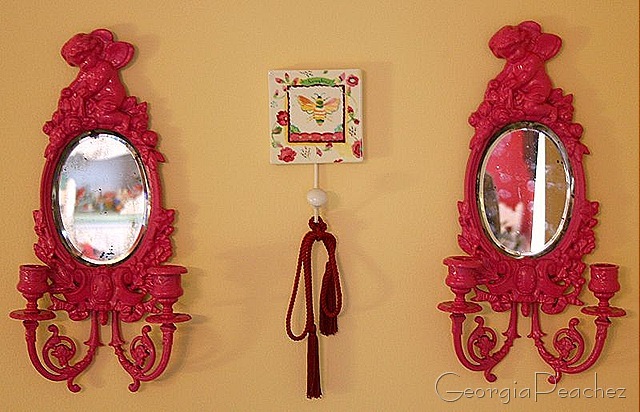 Who isn’t looking for hot pink cherubs?? That is a cool new twist for something so traditional. Leave it to you suzy! Those turned out great! I know what you mean about trying to finish projects. I am working on the same thing! What a wonderful and cheerful color to paint them! They would be great in most any room.